So far this year we’ve awarded volunteers who work with visitors, in the Gift Shop and the health of animals here on Central Wharf. This month, we are honoring a volunteer who works in another important dimension of our work at the New England Aquarium: conservation. Emily Goczalk is a Rescue and Rehabilitation volunteer with over 2,200 hours. 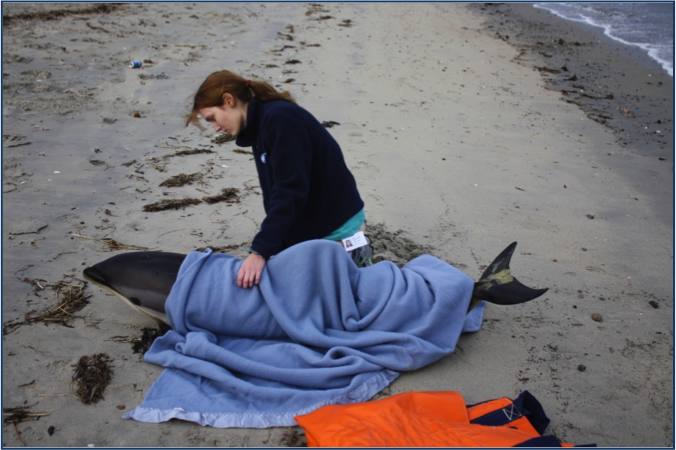 She’s not only volunteered on the husbandry side of Rescue and Rehabilitation at our Quincy facility but also as a field volunteer on our on-call list to respond to stranded animals (see picture). Emily started with the Rescue and Rehabilitation team as an intern in the fall of 2009, after the completion of her internship she stayed on as a volunteer. During her time here, Emily, has shown great enthusiasm and dedication to the program. She is reliable, self-sufficient, and always willing to go above and beyond what is expected of her. I think Emily would be a great pick for volunteer of the month. Thank you, Emily, for your service both onsite and in the field! If you are interested in joining the vibrant community of volunteers at the New England Aquarium, consider reading through a list of positions and applying here!